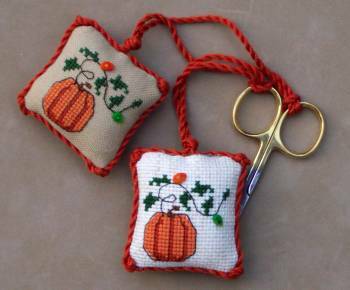 This elegant fall scissor fob is done on 18 ct Lugana (can be done on 14 ct Fiddlers cloth. Can also be done to fit our 3 X 3 frame - click for frame . Complete finishing instructions included. Comes with 2 leaf buttons. Paired with a green or gold scissor, its beautiful!